An article published in Nature- Host genome surveillance for retrotransposons by transposon-derived proteins and authored by Hugh P. Cam, Ken-ichi Noma, Hirotaka Ebina, Henry L. Levin and Shiv I. S. Grewal (December 19, 2007; doi:10.1038/nature06499) discusses transposable elements which constitute a significant percentage of eukaryotic genomes. Organisms have mechanisms that defend them against transposable elements and, as the paper mentions, they include RNA interference and chromatin modifications. In a blog entry about endogenous retroviruses and common descent telic meme commented "Inconsistencies do exist with phylogenetic analyses and are often explained by ad hoc arguments without positive evidence." Analyses need not neglect the possibility that similar effects result from similar defense mechanisms. The Nature article described a genomic surveillance mechanism found in Schizosaccharomyces pombe (yeast). Mechanisms like the one described help ensure the maintenance of genomic integrity. They also aid our understanding of genomic changes and the inheritance of transposable elements. New Method For Reading DNA Sheds Light On How Cells Define Themselves is the title of a Science News article providing information about a biotechnological advance that may reveal details of what some have referred to as a cchromatin code- a code that is separate and distinct from the genetic code associated with DNA sequence patterns. The function of the chromatin code may help us understand cellular differentiation processes and why some cells become liver cells and others brain cells despite having the same DNA. The answer appears to lie in the the way chromatin is structured throughout a genome. Chromatin contains proteins and is known to have a "packing" function in eukaryotic organisms. But the packaging of DNA only hints at the enormous impact chromatin has in determining cell fates. Genes must be accessible to cellular mechanisms that enable their transcription and the subsequent cellular function of RNA or protein end products. This vital regulatory function is governed by both the structure of chromatin and its biochemical make-up. The capacity to map chromatin could mean that we will be able to understand both the past history and the future of particular cells. That in turn holds out much promise for advances in developmental biology and the treatment of disease. "Question: Does anybody know what the current accepted explanation is for the origins of exogenous retroviruses?" Origins of Viruses may not furnish the answer, which is probably unknowable however, possibilities are suggested. The author suggests that viruses have evolved together with their hosts. While there is evidence for viral adaptation, changes in viral genomes do not explain viral origins. Questions about viruses seem to parallel those of cellular organisms. While there is much knowledge about viruses and much data used to support evolutionary concepts related to them, there is little in the way of firm evidence to explain how they originated. The parasitic nature of viruses confounds origin theories. Although viral genomes are small they nevertheless are not explained as resulting from prebiotic chemical reactions. Like their cellular hosts viruses contain nucleic acids whose nucleotides are sequenced as symbolic representations of specified amino acids composing proteins needed to sustain and replicate the viruses. No chemical process could generate this type of symbolic meaning. Not for viral or cellular genomes. One would be tempted to seek an explanation based on natural selection. However although genomic viral changes are well documented and easily understood, citing a host organism to explain viral origins only creates more answers than questions. Evolutionary concepts presuppose the existence of mechanisms that allow for adaptive change. Viruses are dependent on two distinct genomes. Incremental pathways to minimal function are, at this point in time, the stuff of imaginative speculation. The core problem with viral and cellular origin theories lies with the causal options we have been restricted to. All are bottoms-up or emergent in nature. It is assumed that the symbolic complexity, evidenced by genomes, arises from underlying but unknown forces of nature. Unknown forces are manifested by equally indescribable pathways to cells and viruses. Alternatives entail a lateral origin for viruses; the origin being the hosts themselves. Add this to the possible but unknown category. Downward causation is a third paradigm and a very ID friendly one. A Top-Down Approach to Brain Function? Denyse O'Leary has a blog entry titled New theory of brain flexibility offers to explain rapid coping mechanisms, at her blog Mindful Hack. The subject of the blog entry is research related to brain function. Two things caught my interest in light of my recent post Top Down Causation: A Logical Foundation for Intelligent Design. Denyse mentions a dynamic collaboration between multiple brain locations which appears to be a constantly adaptive process. This looks very much like a top-down candidate for neurological functions. Even more attention getting though is the possibility that more accurate predictions about brain behavior may result from what amounts to a top-down perspective. There are those who oppose the use of a top-down or a downward causation paradigm. They object that "real" causal patterns are a consequence of emergence- a bottoms up approach. Bottoms-up restrictions, particularly with regard to origin of life theories and gross anatomical functions, are an impediment to advancing science in my view. A helpful tutorial about HIV-1 reverse transcriptase can be accessed here. While the focus of the link is the reverse transcriptase of a particular retrovirus there is information applicable to reverse transcriptases a whole. Reverse transcriptases are viral enzymes that enable retroviruses to transform their RNA genomes into DNA within the host organism. Here is another informative link. Another important enzyme for retroviruses is integrase.Integrase mediates integration of a DNA copy of the viral genome into the host chromosome. Integrase is composed of three domains. The amino-terminal domain is a zinc binding domain. The central domain is the catalytic domain Pfam:PF00665. This domain is the carboxyl terminal domain that is a non-specific DNA binding domain.1 HIV specific integrase is discussed at this link. Irreversible Inhibition of Human Immunodeficiency Virus Type 1 Integrase by Dicaffeoylquinic Acids is a paper suggesting that the function of integrase makes it an attractive target for antiretroviral agents. Lodi PJ, Ernst JA, Kuszewski J, Hickman AB, Engelman A, Craigie R, Clore GM, Gronenborn AM; , Biochemistry 1995;34:9826-9833.: Solution structure of the DNA binding domain of HIV-1 integrase. Understanding endogenous retroviruses entails a need to know what a retrovirus is. As the name indicates a retrovirus is a type of virus. It has a genome that is made of RNA rather than the more common DNA based genomes. Like other viruses it is parasitic and depends on its host for the transcription mechanism needed to replicate itself. This link provides a concise description of retroviruses and more details about what is mentioned in this blog entry. Mentioned are three genes found in retroviral genomes- gag, pol and env. Pol genes code for a protein known as reverse transcriptase. Reverse transcriptase is critical to the viral capacity to transform its RNA genome into DNA. Another protein known as integrase enables the insertion of this DNA into the DNA of the host. Such insertions can become a permanent part of the host genome when germline cells are affected. Identification of DNA regions bearing molecular markers for retroviruses indicate endogenous retroviruses. Endogenous retroviruses are species specific and those found in human genomes are called human endogenous retroviruses or HERVs for short. Linked here is another helpful site about retroviruses. Darwinists sometimes think that they can account for the evolutionary origin of a complex biological feature simply by citing some kind of experimental or theoretical evidence showing that the complex feature would have provided a selective advantage to its owner. However, such Darwinists forget that, as many have recounted, natural selection only accounts for the survival of the fittest, not the arrival of the fittest. Evidence that a given feature—when fully formed—provides some selective advantage does not demonstrate that the feature can be evolved in a step-wise, mutation-by-mutation fashion. In fact it is a working assumption that functional advantage explains the origin of a given feature. Functional advantage addresses a causal process from a sifting point of view. It does not explain a generating process or a sequence of events. In fact the actual sequence of genomic events is vaguely presented. Although we cannot actually observe a process involving changes over geologic eons, we should demand a theoretical description with more details than has been forthcoming The cited evidence for change over time lies at the molecular level. But if we look at genes connected with the giraffe neck we find little indicating how a sequence of incremental events unfolded. Here is an amply illustrated paper by Wolf-Ekkehard Lönnig which discusses details ommitted by the overly simplistic evolutionary accounts which are all too prevalent. Prokaryotic cells do not have as many forms of transcriptional/ translational genetic regulation that eukaryotic cells have. The nuclear membrane in eukaryotes allows those cells to avoid concurrent transcription and translation. But there still is a very clever solution to genetic regulation in prokaryotes. Along with a repressor protein, that when bound to tryptophan enhances its ability to bind to the operator region of the trp operon (blocking the RNAP from transcribing the operon), the bacterial cell also utilizes attenuation. The trp operon yields gene products that play an enzymatic role in the biosynthesis of tryptophan. This operon contains 7 genes: 1 containing the promoter & operator region (the operator is contained within the promoter), 1 leader sequence and 5 genes that play the active role in biosynthesis of tryptophan. Prior to the 5 genes that encode the enzymes that synthesize tryptophan there is the leader region that also gets transcribed. This leader region encodes 14 amino acids which includes two consecutive tryptophan residues. The leader region along with the 5 genes are transcribed into a polycistronic mRNA. Unique only to prokaryotes this is an mRNA that will yield more than one protein. The mRNA is divided into 4 domains. Domain 3 of the mRNA is able to base pair with either domain 2 or domain 4. Domain 1 includes the leader sequence along with the attenuator; the section that will require 2 consecutive trp amino acids during translation. If Domain 3 base pairs with domain 4 a stem loop structure will form resulting in the termination of the transcriptional/translational process. When trp levels are high in the cell the ribosome translating the mRNA quickly covers domains 1 & 2, allowing domain 3 to base pair with domain 4 halting the process and ultimately preventing any more tryptophan from being synthesized. If trp levels are high the ribosome is able to quickly use a trp-charged tRNA to add to the growing peptide. When trp levels are low the ribosome stalls at domain 1 because trp-charged tRNAs are in short supply, which allows domain 2 to associate with domain 3. This prevents the termination step loop that forms when domain 3 associates with domain 4. In this situation the ribosome is able to continue translating the mRNA to yield the enzymes that will synthesize tryptophan. A clever and intuitive solution to prevent a needless energy drain that would stress the cell. A couple of months ago I gave a presentation entitled "Is belief in divine creation rational? ", which you can listen to on-line. In that talk, I concentrated on one particular line of argument. Consistent materialists ultimately have nothing to say to us - because consistent materialism can easily be shown to be unable to explain the basis for the very acts of rational discourse and logical argumentation. The very manner in which they go about their business - assuming before they begin in the reality of consciousness, minds and rationality - refutes them. Turning this around, we have a solid proof for the reality of God who has made us in his image, the so-called "transcendental argument" - because if you assume anything to the contrary, you have no basis on which to prove anything else at all. Well as I say, that's all covered in my presentation. 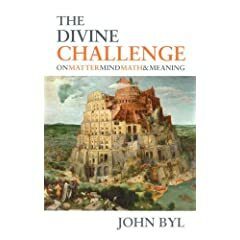 This blog post is a book review, of John Byl's "The Divine Challenge: On matter, mind, math & meaning". I had not heard of Byl's book at the time I gave my talk, and wish I had, because it would have been ideal to recommend afterwards when I was asked for further reading material. John Byl is Professor of Mathematics and Head of the department of Mathematical Sciences at Trinity Western University, British Columbia in Canada. He has a Ph. D. in astronomy from the University of British Columbia. In this book, he seeks to make a comprehensive overview of naturalism and its power (or not) to explain reality, particularly in relation to the three inter-related "worlds" of matter, mind and mathematics. I am convinced that this is the territory which theists today need to concentrate on if they are to succeed in rebutting the arguments of atheists. When we talk about these issues, we begin challenging the foundations of the atheist world-view. It is a common debating ploy, and a superficially plausible one, for today's atheists to say "we shall not believe in a God until his existence is rationally proved to us; as yet, we find all such proofs lacking, and hence we do not believe." This is to make atheism the default, and to excuse it the task of having to justify its own set of assumptions and their implications - including the foundations for the very concept of a rational proof. Once theists start talking about these things, the atheist soon finds himself in very big trouble. If you've never heard an atheist utterly dismantled using this method, then you should be downloading Professor Greg Bahnsen's audio debate with Professor Malcolm Stein - The Great Debate - Does God Exist?, or reading Douglas Wilson against Chrishopher Hitchens. I've learnt a lot by reviewing debates including the ones above. Byl, though, has practically provided us with a primer for the theoretical material behind such debates. Like myself, Byl is a mathematician by training (though unlike myself he's one with a professorship!). I've found that mathematics can be something of a closed world to outsiders, and few understand its fundamental significance in the universe. Byl unfolds it masterfully, explaining the intimate and yet inexplicable (from a naturalist point of view) connections between it and physical reality. Mathematics appears from one angle to be entirely abstract. Throughout history, its practitioners have discovered concepts and theorems which appear to have no even remotely possible connection to material reality. But, time and again, those discoveries have later been found out to be reflected in a very profound way in the physical universe. Some mathematical discovery of the past has suddenly been found to be a key to understanding some empirical phenomenon, and a new advance has been made in one of the physical sciences. Then there is the connection between matter and the mind. What is consciousness? How can it be accounted for? On what basis can we expect our minds to be reliable? What is the connection between our abstract thoughts and reality? How can our minds influence the physical world? What is the connection between the mind and the brain? What is the cause of our thoughts? What about free will? How is it that our minds apparently have the capacity to understand reality, and how can this be accounted for? What is chance, and in what sense can it be said to be a cause of anything? Byl discusses these and a whole host of related issues in a scholarly yet easy to read style. His research is comprehensive - the bibliography of works cited runs to 11 pages, and I never got the impression that Byl had cited a work other than because it advanced the argument he was making. The authors quoted run from Calvin to Chomsky, and Darwin to Derrida. Byl makes the point very effectively that if naturalism has (as indeed it does), to ultimately write off almost every aspect of reality as either inexplicable or illusional, then this really amounts to no more than saying that naturalism is a non-starter when it comes to explaining reality. Any worldview which cannot account for the irrefutable facts of existence, is not a worldview which a person can rationally embrace. Byl gives further consideration to viewpoints from beyond naturalism, briefly examining postmodernism and existentalism. This section is briefer, but he does enough to show their self-refuting nature. The remainder of the book is taken up as Byl rises to the challenge of demonstrating that Christianity gives a coherent explanation of the various phenomena which he has described. The Bible's view of a triune God who has created all things and created man in his image is shown to be the ultimate Ockham's razor: it requires none of the dodges or despair that naturalist writers end up in, but gives a credible account of the various phenomena relating to minds, matter and mathematics and the various inter-relations between them. More than that, it also explains, through the Bible's history of mankind's rebellion against God and original sin, why naturalists are so keen to chose another explanation! Byl is also helpful in explaining that Christianity is though vastly more than a mere system of correct philosophy; it is God's loving plan to save us and to bring us to know him, through Jesus Christ. I appreciated this book particularly as a mathematician. When I was at university, I observed that the proportion of atheists was very low amongst the "mathmos". Mathematicians are by default realists in their work - approaching new theorems as discovery, not invention. Mathematics, in its apparent structure, elegance and universality resists naturalism at a very fundamental level, and Byl's book refreshed me by explaining how that was so in a very straightforward way. I heartily recommend this book. It examines deep issues in an intellectually honest and thorough way, in words and at a pace that should not be beyond any reader. Byl is easy to follow; he has a deep enough grasp of what he's talking about to be able to explain it all simply. I suppose that this book won't be known about in many circles due to it being published by a Reformed Christian publisher - I hope that this review of mine will give it more of the publicity it deserves. About 8% of the human genome mass consists of sequences of retroviral origin and it is thought that in the evolutionary past, exogenous retroviruses formed proviruses in the genomes of germ cells of ancestral primate species. Some of the proviruses are thought to have been fixed (through germ-line integration) in the population and were inherited as stable genomic components named ERVs. There are different strategies to determine evolutionary ages of ERV families and ERV proviral loci. A) BLAST the hell out of them. When extensive genomic sequence data information is available, BLAST software can be used to determine whether a specific ERV sequence (FASTA format) is present in various species of interest. This NCBI site is probably the best. Along these lines let it be noted that the Human Endogenous Retrovirus Database can be accessed at this link. Discussions of this nature tend to include much technical nomenclature but it is my intent to make our blog entries comprehensible to as large a group as possible. Therefore there will be explanatory blog entries in the coming days seeking to define terms that will appear. Analytical blog entries will link to these explanations to enhance clarity. Thaxton, Bradley & Olsen's, "The Mystery of Life's Origin" (1984), which is generally credited with marking the beginning of the modern Intelligent Design movement. Stephen Jones is writing a book titled Problems of Evolution. His blog provides a glimpse of what is to come. Multiple Cellular Codes is a Week in Science article detailing important breakthroughs in our understanding of cellular functions and the codes by which they operate. Three are cited and linked to the different functions they enable. What force of nature generates molecular codes? Haven't you heard? Selection dunnit. Specifically how? Only a creationist would ask such a question. RNA polymerase I (Pol I). It transcribes the rRNA genes for the precursor of the 28S, 18S, and 5.8S molecules (and is the busiest of the RNA polymerases). RNA polymerase II (Pol II; also known as RNAP II). It transcribes protein-encoding genes into mRNA (and also the snRNA genes). RNA polymerase III (Pol III). It transcribes the 5S rRNA genes and all the tRNA genes. The transmission of genetic information from DNA to messenger RNA to protein depends on the function of a large number of small noncoding RNA molecules. The genes encoding these RNAs are transcribed by RNA polymerase III (Pol III), a 17-subunit protein complex whose structure is closely related to that of RNA polymerases I and II. Here, we report the effect of a mutation in a gene encoding one Pol III subunit, Polr3b, which disrupts proliferation and growth of tissue progenitor cells in the zebrafish digestive system. Analyses of a nearly identical mutation in the yeast S. pombe gene encoding Polr3b, also known as Rpc2, suggested that the zebrafish mutation disrupted the mutant Polr3b protein's interaction with another Pol III subunit, Polr3k, also known as Rpc11. Overexpression of the gene encoding Polr3k in the Polr3b mutants partially rescued (reversed) the mutant phenotype. These findings extend our knowledge of the mechanism of Pol III function, which appears to have been highly conserved during eukaryotic evolution. Furthermore, these data also suggest that assembly of the 17-subunit Pol III enzyme is a dynamic process, since Polr3k overexpression can partially rescue the mutant phenotype. Understanding how Pol III is assembled has implications for human disease, since Pol III activity is markedly increased in most cancers. RNA Polymerase III (Pol III) is a 17-subunit complex that is responsible for the transcription of small noncoding RNAs such as transfer RNAs (tRNAs), 5S ribosomal RNA (rRNA), U6 small nuclear RNA (snRNA), 7SL RNA, and others in eukaryotes [1,2]. The two largest subunits, Rpc1 (160 kDa) and Rpc2 (130 kDa), are highly homologous to their counterparts in Pol I and Pol II, and together provide a large surface area for interaction with many of the other subunits . Structural analyses of Pol III complexes [3,4], together with two-hybrid analysis , have identified multiple subunit interactions (reviewed in ). These, together with biochemical and genetic analyses, have led to a model that attributes some of the unique functions of Pol III, including its high processivity, efficient transcription termination and recycling activity, RNA 3′ cleavage activity, and interaction with diverse promoters, to specific individual subunits. Mutational analyses in yeast clearly show that an intact Pol III system is essential for cell growth. The effects of reduced Pol III function are predicted to be broad, including protein synthesis necessary for cell-cycle progression (tRNAs), ribosome biogenesis (5S rRNA), mRNA splicing (U6 snRNA), and membrane targeting of newly translated proteins (7SL RNA). Pol III transcription is tightly regulated during the cell cycle  and in response to cellular stress . Recent studies in human cells have also highlighted the roles of oncogenes and tumor suppressors such as Rb [8,9], p53 [9–11], and cMyc [9,12] in controlling the interactions between the transcription factors that bring the Pol III complex to the promoters of its target genes (reviewed in [13,14]). Other proteins, such as Maf1 [15–18] and the oncogenic kinase CK2 [19–20], can regulate Pol III function through direct interactions with the Pol III complex. Thus, eukaryotic cells have evolved multiple independent mechanisms for regulating Pol III activity. It would have been interesting if Michael Behe had focused on biosynthesis as an example of irreducible complexity. I would have enjoyed reading the responses of critics. A depiction of pathways to the evolution of "multiple independent mechanisms for regulating Pol III activity" would have been most interesting. So would a gradual, incremental model for cell-cycle progression.